If you think it’s too late to start now, and you’re thinking “I’m so out of shape working out is just a waste of time”. It’s never a waste of time, any kind of workout for anyone of any age will help you. We go along in our everyday lives doing the same thing over and over and yes we get into a rut. It means we are making ourselves grow old. Your brain is still the boss of your body. It gives all the commands. When you restrict your activity to the point where you are sedentary most of the day (spending more than half of your waking hours either sitting or lying down) the body has to assume you’re at the end of your life and will start to shut down somebody functions in order to survive. The body’s first and most important function is survival and it will do whatever it has to. When you are mostly sedentary the body will start to conserve energy and also store fat, to protect against starvation. That’s one reason when you slow down, you’ll gain weight unless you adjust your diet. You have to out-smart your body so it will burn stored fat instead of adding fat. You can never let your body think you’re going to starve. That’s the reason you can’t lose weight by eating less. Sooner than later, your body will start to think you’re going to starve and stop burning calories and start hoarding calories and you gain fat. You noticed I said gain fat because you don’t have to gain weight to gain more fat. When you become sedentary you lose muscle and muscle weighs twice as much as fat weighs. In other words, one cubic inch of muscle weighs the same as two cubic inches of fat. The same one ounce of fat is twice as big as one ounce of muscle. So you can get on the scale and you weigh the same but your pants don’t fit anymore and you think they shrunk. They aren’t shrinking, your growing wider. If you’ve taken a long break from exercise or you’re just getting started, this six-week program is the perfect place to begin. You’ll establish an exercise routine with simple, straightforward workouts that progress from week to week. The workouts provided are only suggestions and won’t work for everyone, so modify them as needed to fit your fitness level, schedule, and preferences. See your doctor if you have any injuries or conditions or if you’re taking any medications. Let him know what kind of exercises you’re going to be doing. Record your vital statistics to track weight loss progress. Prepare for your workouts.The cardio workouts are designed to be done on any cardio machine or outside. If machines aren’t your thing, substitute your own workouts (videos, classes, outdoor exercise, etc.) or choose something else you might enjoy. Gather your equipment. For the strength workouts, you’ll need a variety of equipment including dumbbells, an exercise ball, resistance bands, a medicine ball, and a mat. If you’re new to strength training, familiarize yourself with the basics and how to choose the right weight for each exercise. Your goal this week is to focus on the intensity of your workouts. During each cardio workout, use one of the methods above to track how you feel and match your Perceived Exertion to the suggested levels. Most workouts will be at a moderate level, which means you’re just out of your comfort zone (but not huffing and puffing). Pay attention to that this week to get a sense of your exercise intensity. These workouts are short and simple and should take you about 35-45 minutes. Equipment Required: Light dumb bells, an exercise ball, or chair and a mat. I’ll make this simple if you’re confused. You starting with cardio which means something like walking fast or biking fast and then strength training which means dumb bell exercises. You get to pick the exercises. You can buy, rent, or get a video at the library and get ideas for exercises you can do. Part 3 is important it’s the stretching after a workout to avoid cramping. Today you don’t have a structured workout schedule to follow, but a simple walking workout and a seated stretch to relax your shoulders, neck, and back. Workout 1: Find at least 10 minutes for a brisk walk today. Today your schedule is the same as Day 1, but with a new cardio workout. Today you’ll choose either a 13-minute walking workout or a 10-minute cycling workout, but feel free to combine the workouts if you want something longer. Equipment Required: Light dumbbells, an exercise ball or chair and a mat may be used if you feel you want to do this exercise. Equipment Required: Light dumbbells, an exercise ball or chair, and a mat. I’ll continue with my next post. As you can probably guess, this will have to comprise a few days worth of posts. All I’m trying to do this first week is to get you in a routine. You have to get use to exercise and feel good about exercising. I write E-books and blogs about fitness and weight loss. I’ll show you the cheapest, inexpensive way to lose weight. 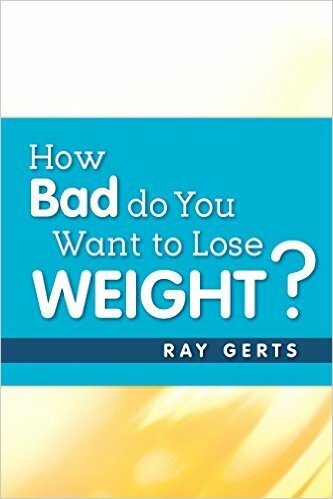 Right now and for a limited time, my E-book, “How Bad Do You Want To Lose Weight”, is $1.99 on all the major sites. Amazon.com, iBooks, B&N.com, Scribd.com, Kobo.com and many others in several other countries.